A new report compiled by Norway’s leading climate researchers predicts much warmer temperatures on the Arctic island group of Svalbard in the years ahead, with more rain, flooding and landslides expected. The report has been described by experts as both “very dramatic” and among the “most frightening” to be released yet. Much of the damage is already occurring, researchers point out, given melting ice on and around Svalbard and its recent spate of avalanches and landslides. 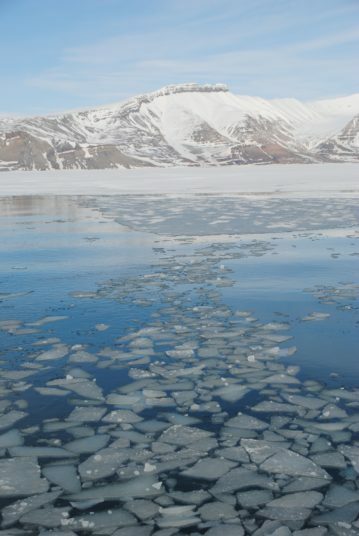 Svalbard’s glaciers are already said to be “considerably reduced” just in the past few years. Temperatures have been warmer on Svalbard than on the Norwegian mainland several times this winter, rain has fallen instead of snow in December, and the permafrost has melted so much that buildings need to be reinforced. The entrance around Svalbard’s famed international seed vault that was dug into a mountainside above the airport and Longyearbyen less than 20 years ago also has needed to be reinforced. “The findings are very dramatic,” Inger Hanssen-Bauer, a senior researcher at the state Meteorologic Institute, told Norwegian Broadcasting (NRK) when the report was released this week. It’s called “Climate in Svalbard 2100” and predicts that temperatures can be 10 degrees higher then than they are now. The speed at which changes are occurring, and the sheer visibility of them, are causing the greatest concern. Temperatures have already been above normal for the past 98 months in a row, according to the report, and the month of January was 4.7 degress warner than normal. Another report issued just last fall also noted how climate change was seriously threatening Svalbard. “The sad fact is that climate change has greater effect the farther north you come,” Hege Hisdal, a hydrologist and division chief at Norway’s state waterways and energy agency NVE (Norges vassdrags- og energidirektorat). She said the increase in temperatures and precipitation will be higher on Svalbard than on mainland Norway, and that a reduction in the permafrost and glaciers will have “huge consequences.” Among them: an increase in erosion and wildlife under threat for lack of food and the ice over which they’ve traveled. Norway’s governments have been subject to harsh criticism for years, however, over their refusal to rein in the country’s large offshore oil and gas industry and instead dole out even more licenses for more oil and gas exploration and production, not least in Arctic areas. Both the left-center government led by the Labour Party, that held power from 2005 to 2013, and the current four-party government coalition led by the Conservative Party ever since have failed to heed ongoing calls reduce emissions by reducing offshore oil and gas activity, because of the importance oil and gas has for Norway’s strong economy and overall prosperity. Elvestuen’s party, along with the Christian Democrats, has succeeded in halting oil industry plans to drill off scenic Lofoten and Vesterålen in Northern Norway, and restrictions are in place near the Arctic ice cap and around some island settlements. At the same time, his colleagues in Norway’s oil ministry, under the political control of the conservative Progress Party since 2013, have been proud of the interest oil companies still have in the Norwegian Continental Shelf and continued to dole out licenses for more Arctic exploration, over the loud protests of environmental organizations, climate researchers and many others both inside and outside Norway. The government insists it will meet ambitious emission reduction goals, but most of them are expected to be taken on the mainland and not in the offshore oil sector, where they’re far bigger and can pose great threats to sensitive Arctic areas. Norway also has a long record of buying itself out of emission reductions though its funding, for example, of rain forest protection in other countries like Indonesia and Brazil. The new climate report was compiled by researchers at the Meteorologic Insitute, NVE, Bjerknessenteret and NORCE, and is available here (external link to the Norwegian Environment Agency that commissioned the report).